Several districts in Texas’ 2011 congressional and legislative maps were found unconstitutional, a new gerrymandering lawsuit was filed in Georgia, and more. 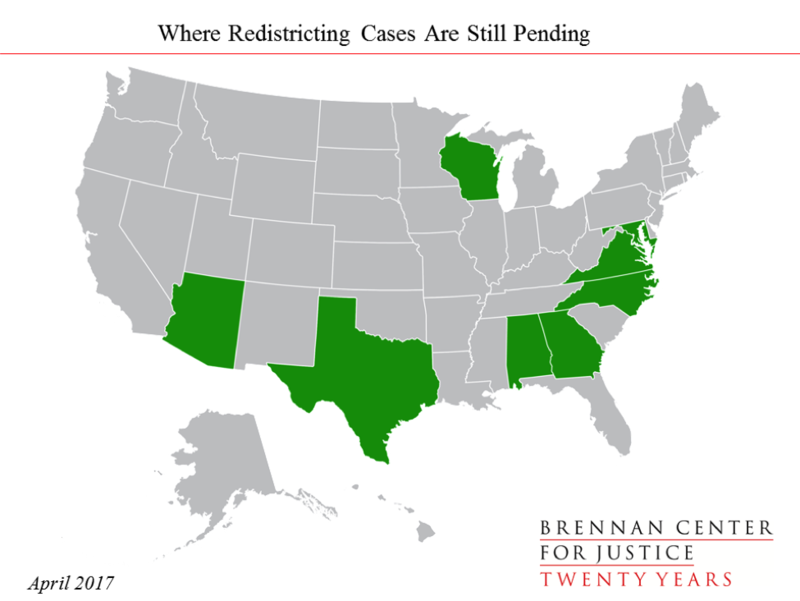 Since our March litigation update, a three-judge panel ruled that several districts in Texas’ 2011 congressional and legislative maps were unconstitutional racial gerrymanders, a group of plaintiffs filed a new racial and partisan gerrymandering lawsuit in Georgia, and plaintiffs in a partisan gerrymandering lawsuit in Virginia appealed a circuit court’s ruling to the state Supreme Court. In Wisconsin, a landmark partisan gerrymandering ruling looks to be heading to the U.S. Supreme Court. Last November, a panel of three federal judges declared that the state house plan adopted by Wisconsin’s Republican-controlled legislature in 2011 was an unconstitutional partisan gerrymander that violated both the Equal Protection Clause and the plaintiffs’ First Amendment freedom of association. The ruling was the first time in over three decades that a federal court invalidated a redistricting plan for partisan bias. To evaluate the constitutionality of the map, the panel applied a three-part test that asked whether the map had discriminatory intent or purpose, had a discriminatory effect, and if there were some other legitimate reason, like the natural political geography of the state, that the maps had a political skew. The panel concluded that the map displayed both bad intent and bad effect, citing evidence that the map drawers used special partisan measurements to ensure that the map maximized Republican advantages in assembly seats. Despite Democrats winning a majority of the statewide Assembly vote in 2012 and 2014, Republicans won sixty of the ninety-nine Assembly seats. Wisconsin Republicans dispute that they intentionally engineered a biased map, arguing that partisan skews in the map reflect a natural geographic advantage the party has in redistricting as a result of Democrats clustering in cities and Republicans spreading out more evenly throughout the state. The court, however, concluded that the state’s natural political geography “does not explain adequately the sizeable disparate effect” seen in the previous two elections. Wisconsin filed an appeal to the Supreme Court on February 24, 2017. If, as expected, the Supreme Court decides to hear the case, argument would be in the Court’s 2017-2018 term. Key pleadings for Gill v. Whitford can be found here. A challenge to alleged partisan gerrymandering is also pending in Maryland, where a federal lawsuit targeting the redrawing of Maryland’s Sixth Congressional District will likely go to trial later this year. In Benisek v. Lamone, the plaintiffs argue that the 2011 congressional map adopted by the Democratic-controlled legislature violates Republican voters’ representational and associational rights guaranteed by the First Amendment because lawmakers deliberately targeted and punished voters who supported Republican candidates when drawing district lines. According to the plaintiffs, lawmakers intentionally used information about voters’ histories and party affiliations to place Republican voters in districts where they were outvoted by Democrats, and thus flip the Sixth District from a reliable Republican seat into a safe Democratic one. Last August, the three-judge panel hearing the case denied the state’s motion to dismiss and held that a map could be an unconstitutional partisan gerrymander if the plaintiffs could satisfy a three-part test laid out by the court. Discovery is currently underway and the current expectation is that the panel will hold trial in the case late this summer or early fall. Key pleadings for Benisek v. Lamone can be found here. In North Carolina, three separate cases are challenging the 2016 remedial congressional plan, which the North Carolina legislature adopted to replace an earlier plan that the courts struck down as a racial gerrymander. The three-judge panel denied the plaintiffs’ objections, ruling that the court could not “resolve this question based on the record before it,” and the plaintiffs appealed to the Supreme Court. Briefing asking the Court to hear the case has been completed, but the Court will likely wait to decide whether to take the appeal until it has issued its opinion in the Cooper racial gerrymandering appeal (see below). Key pleadings for Harris v. Cooper can be found here. In the meantime, groups of plaintiffs led by the League of Women Voters and Common Cause filed two additional cases – both currently pending in the Middle District of North Carolina –challenging North Carolina’s 2016 remedial map on partisan gerrymandering grounds. The three-judge panel denied the state’s motions to dismiss the cases in an order entered March 3, 2017, and set the start of a joint trial in the cases for June 26, 2017. Key pleadings for League of Women Voters v. Rucho can be found here. Key pleadings for Common Cause v. Rucho can be found here. In addition to the three North Carolina partisan gerrymandering cases discussed above, three cases contend that North Carolina’s 2011 legislative and congressional maps were racial gerrymanders. In Cooper v. Harris, North Carolina is asking the Supreme Court to reverse a three-judge panel’s ruling that the state’s original congressional map was a racial gerrymander. The dispute in the case centers on whether Republican lawmakers unconstitutionally packed African American voters in North Carolina’s 1st and 12th Congressional Districts when redrawing the 2011 map. The panel below agreed with the plaintiffs, ruling that the legislature prioritized race over other redistricting principles and packed minorities into districts where African Americans had long previously elected their preferred candidates with success. North Carolina rejects these rulings, contending that it drew one of the districts to comply with the Voting Rights Act and the other for partisan political advantage. The state appealed to the Supreme Court last summer and the Justices held oral argument in December at the same time they heard argument in Bethune-Hill v. Virginia State Board of Elections (discussed below). Update: On May 22, the U.S. Supreme Court affirmed a three-judge panel’s ruling that North Carolina’s 2011 congressional redistricting plan was an unconstitutional racial gerrymander. The Court will now decide whether to hear argument in Harris v. Cooper, an appeal claiming that the General Assembly’s 2016 remedial map—which was supposed to cure the racial gerrymander—is an unlawful partisan gerrymander. Key pleadings in Cooper v. Harris can be found here. In North Carolina v. Covington, North Carolina also is asking the Supreme Court to reverse the ruling of a different panel of three federal judges that 28 of the state’s legislative districts were unconstitutional racial gerrymanders. In August, the panel unanimously agreed with the plaintiffs that the 2011 state map was designed to weaken the influence of black voters by unnecessarily increasing the percentage of black voters in districts where they had previously been successful in electing their candidates of choice. The panel ordered the state to redraw those districts by March 15 and then hold a special primary and general election in fall 2017. The state submitted an emergency motion to stay the panel’s order to the Supreme Court. The court granted the motion to stay, which puts the special elections on hold while the appeal process proceeds. A decision by the high court on whether to hear the state’s appeal is expected before the end of June. Key pleadings for North Carolina v. Covington can be found here. The third North Carolina racial gerrymandering appeal currently pending before the Supreme Court, Dickson v. Rucho, arises from a state court challenge to North Carolina’s 2011 congressional and legislative maps. In Dickson, the plaintiffs contend that North Carolina’s maps violated state and federal law and were racially gerrymandered. The plaintiffs allege the legislature used a racial proportionality target in order to determine the number of majority-minority districts that would be drawn, and required that each district meet a fixed 50% black voting age population (BVAP) percentage target. The legislature attempted to justify its actions as necessary to avoid violating Sections 2 and 5 of the Voting Rights Act (VRA). In a 4-2 decision, the North Carolina Supreme Court agreed with the trial court that complying with the VRA was a compelling interest for the legislature when drawing its maps, and ruled that the challenged districts were constitutional. On appeal, the U.S. Supreme Court remanded for further proceedings. The state court again ruled against the plaintiffs, however, leading them to file a second petition for Supreme Court review, asking the Court to determine whether Section 2 of the Voting Rights Act requires a jurisdiction to draw a racially proportionate number of majority-black legislative districts each with a BVAP of more than 50%. The petition is pending with the Court. Key pleadings for Dickson v. Rucho can be found here. In Bethune-Hill v. Virginia State Board of Elections, African American voters are challenging legislative districts that they claim unconstitutionally packed African Americans. In proceedings in district court, a panel of three federal judges ruled that race was a predominant factor in the drawing of one of the state’s African-American districts in the 2011 House of Delegates map, but the legislature’s reliance on race was justified because of the state’s need to comply with the Voting Rights Act. The panel held that race was not a primary consideration in the design of 11 other challenged districts despite the legislature’s imposition of a 55% black voting age population floor for those districts. The Supreme Court held oral argument in December 2016. On March 1, 2017, the Supreme Court ruled in a 6-2 decision that the panel had applied the wrong legal standard when concluding that race had not predominated in the drawing of the 11 challenged districts. The Court held that the panel had improperly required plaintiffs to show, as a precondition, that a challenged district was inconsistent with traditional redistricting principles. According to the Court, plaintiffs in racial gerrymandering cases could establish the predominance through a variety of direct and circumstantial evidence and that, even if a district otherwise complied with traditional redistricting principles, it could still be found unconstitutional if evidence established that race was the predominant factor in its creation. The Court remanded the case to the trial court to evaluate the districts under this standard. On April 6, the court denied the plaintiffs’ request for expedited briefing but directed the parties to file statements of position outlining proposals for the conduct of further proceedings in the case. In their subsequently filed proposals—which are now pending before the court—the plaintiffs have requested that the case be resolved via briefing on the existing record, while the defendants have requested additional discovery and evidentiary hearings. Key pleadings for Bethune-Hill v. Virginia State Board of Elections can be found here. Alabama’s legislative map also is the subject of a racial gerrymandering challenge. A three-judge panel originally rejected claims of racial gerrymandering. But, in 2015, the Supreme Court reversed in a 5-4 decision and instructed the lower court to reconsider whether the new redistricting map drawn by Alabama’s Republican-led legislature diluted the voting strength of the state’s African Americans by packing them into districts. Although Alabama was under an obligation imposed by the Voting Rights Act not to diminish the effectiveness of existing African American districts, the Supreme Court concluded that the percentage of the black voting age population necessary to accomplish that end could not be determined by fixed rule but instead required a district-by-district analysis. On remand, the panel ruled in a 2-1 decision that 12 of the 36 challenged districts were unconstitutional racial gerrymanders, but upheld the other 24 districts. The court has approved a procedure for the legislature to adopt a new map that corrects the deficiencies in the 12 unconstitutional districts in time for the 2018 elections. Key pleadings for Alabama v. Alabama Legislative Black Caucus can be found here. On April 24, the Georgia State Conference of the NAACP filed a complaint against the State of Georgia contending that Republican legislators engaged in both racial and partisan gerrymandering when they executed a mid-decade redistricting of the state’s house map. The lawsuit focuses on two state house districts, which the plaintiffs claim Republicans redrew in 2015 to protect white Republican incumbents and deny African American voters an equal opportunity to elect their candidates of choice. The plaintiffs are asking a three-judge panel to declare these two districts unconstitutional, order them redrawn, and impose preclearance requirements on Georgia for the next ten years. Individual voters in Texas, alongside organizations representing African Americans and Latinos, filed a series of lawsuits in 2011 alleging Texas’ congressional and state house plans violated the U.S. Constitution and Section 2 of the Voting Rights Act. Several of these suits were later amended to include claims regarding replacement maps adopted by the Texas Legislature in 2013. On March 10, 2017, the panel issued a ruling on challenges to the 2011 congressional map. The court’s 2-1 decision held that four districts in the plan were unconstitutional racial gerrymanders and that the creation of TX-35 could not be justified by a need to comply with Section 2 of the Voting Rights Act. The panel also ruled that Texas had unconstitutionally and intentionally packed and cracked minority voters in the Dallas-Fort Worth area and in the creating the configuration of TX-23 in the 2011 congressional plan. However, the court rejected intentional vote dilution claims related to the greater Houston area. On April 21, the panel issued a 2-1 decision that several districts in the 2011 state house plan were the result of an intentional effort to dilute the voting power of minority communities, in violation of the Fourteenth Amendment and the Voting Rights Act. The court also ruled that several districts violated one-person, one-vote requirements and that one district in San Antonio was a racial gerrymander. The court has not yet ruled on requests that Texas be placed under Section 3 preclearance. In the meantime, the plaintiffs filed a motion to enjoin the 2013 congressional map and proposed a scheduling order to ensure a remedial map is in place in time for the 2018 elections. Update: The court has set trial on the 2013 state house and congressional plans for July 10-15. Key pleadings for Perez v. Texas can be found here. In Vesilind v. Virginia Board of Elections, a group of citizens contend that Virginia’s 2011 legislative districts violate the state’s constitution. The plaintiffs argue that the General Assembly improperly subordinated the constitutional requirement of compactness to achieve other political objectives, such as political advantage and incumbent protection. In September, the Virginia Supreme Court remanded the case for further proceedings. On March 31, a Richmond Circuit Court judge issued a ruling upholding the constitutionality of the challenged districts. The plaintiffs appealed the decision to the Virginia Supreme Court. Lawmakers and voters in Arizona are challenging the state’s congressional maps for constitutional deficiencies under the state constitution. Republican legislators and voters filed their first complaint in 2012, alleging the state’s independent redistricting commission did not follow mandatory constitutional guidelines when it drew the 2011 congressional map. The plaintiffs singled out provisions that require map drawers to comply with Sections 2 and 5 of the Voting Rights Act, evaluate the competitiveness of districts, hold a meaningful public comment period, and consider the legislature’s recommendations. The court dismissed one count in the complaint for failure to state a claim. After the plaintiffs filed a second amended complaint, the Superior Court of Arizona stayed the case pending the U.S. Supreme Court’s resolution of Ariz. State Legs. v. Arizona Independent Commission, a case in which the constitutionality of the commission itself was at question. After the Supreme Court issued an opinion validating Arizona voters’ right to remove the responsibility for redistricting from the state legislature and delegate it to an independent redistricting commission, the plaintiffs filed a third amended complaint claiming the commission failed to comply with constitutional procedures. The court held oral argument on the parties’ cross-motions for summary judgment on February 10, and took the matters under advisement. On March 16, the Superior Court dismissed the challenges and requested that the Redistricting Commission file a proposed form of judgement. Update: The plaintiffs in Leach v. Arizona Independent Redistricting Commission have decided not to appeal a Superior Court judge’s March ruling dismissing claims that Arizona’s redistricting commission violated open meetings requirements and used improper procedures to draw the state’ s congressional maps. A hearing to formally conclude the case is scheduled for July.